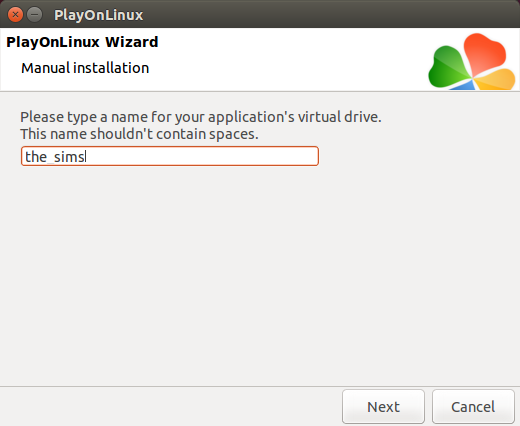 After reading my article on installing and playing Minecraft using Ubuntu, a reader asked whether it was possible to play other games using Ubuntu such as “The Sims” and “Civilisation”. I have written articles previously showing how to use PlayOnLinux to install classic Windows and DOS games. The user in question was having issues with a missing file error so it made me wonder whether there was a problem that I could resolve. 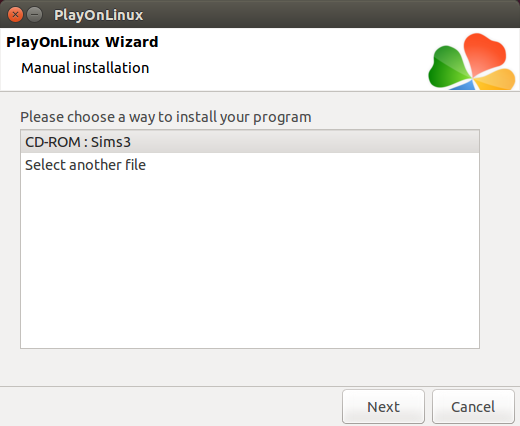 I therefore decided to try out “The Sims” to see if I could install it and play it on a computer running Ubuntu. The version I am using is “The Sims 3” which I bought on CD a couple of years ago and I haven’t really found time to play it yet. 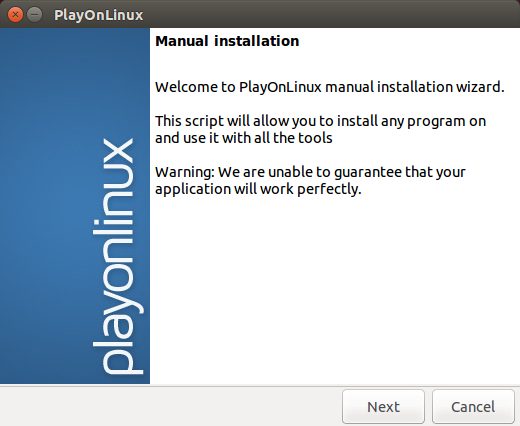 PlayOnLinux is available in the Ubuntu Software Centre. Open the Software Centre by clicking the icon on the launcher that looks like a folder with an “A” on it or by pressing the super key (Windows key) on your keyboard and search for “Software Centre”. Once you have the Software Centre open use the search box in the top right corner to find “PlayOnLinux” and then click “Install”. You can also use the terminal to install PlayOnLinux. The quickest way to open a terminal window in Ubuntu is to press CTRL, Alt and T at the same time. There are lots of steps to follow and lots of screenshots but it is fairly straight forward. First things first, place the CD in the drive and open PlayOnLinux. Choose the games category and then click the “install a non-listed program” link. Click “Next” at the welcome message. 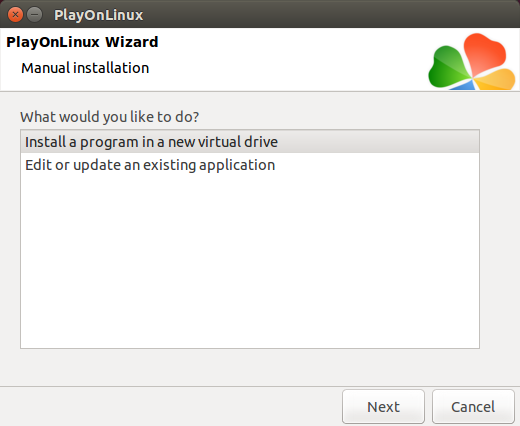 The next screen asks if you want to create a program in a new virtual drive or edit an existing one. Generally you would edit an existing one if you have made a mistake. Enter a name for the virtual drive for your application. It can’t contain spaces. 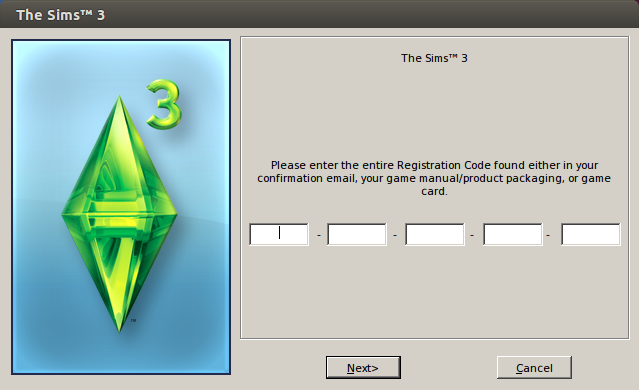 As this guide is about installing “The Sims” it might be a good idea to go with “The_Sims”. You can now configure various aspects of the virtual drive. For instance you can choose a specific version of WINE or configure WINE to base itself on a different version of Windows or to change the screen resolution. You can also install extra libraries. I always leave all this stuff until after the installation. You can now choose whether to create a 32 bit or 64 bit installation. 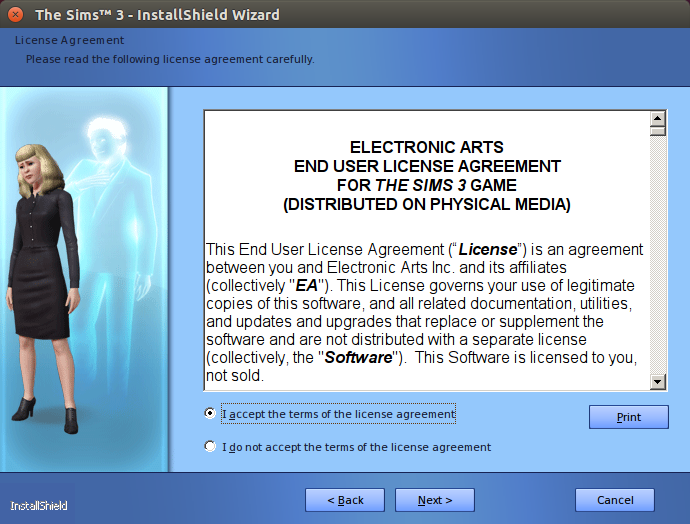 The version of The Sims I am using is “The Sims 3” which was released as a 32-bit binary and therefore I chose to create the 32-bit Windows Installation. The next step is to choose where you are installing from. If you aren’t installing from CD click the “Select another file” and navigate to the location of the installer. If you have a CD click on the CD-ROM and click “Next”. 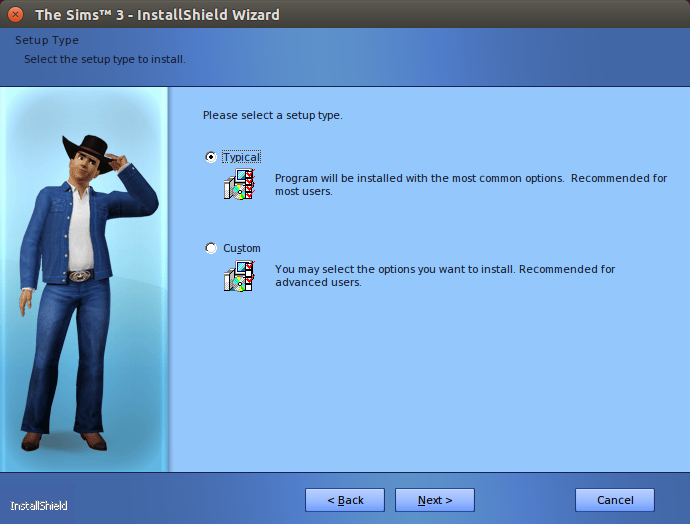 The installer for “The Sims” should start. 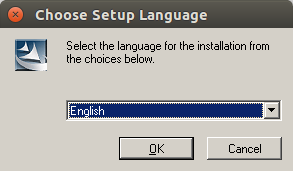 Choose your setup language and click “OK”. 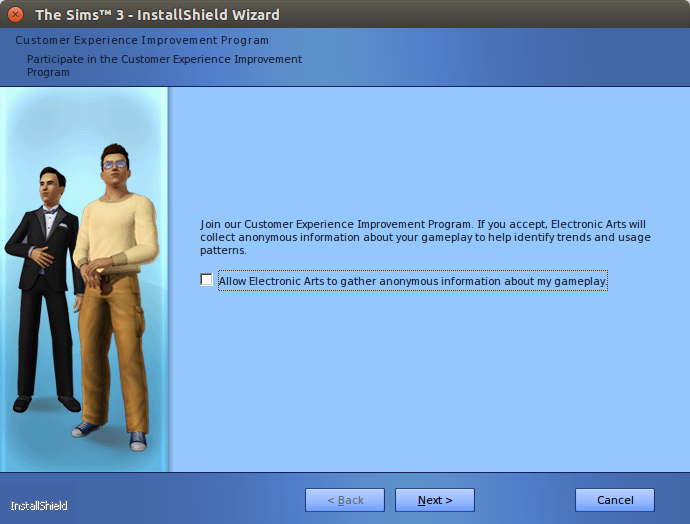 At “The Sims installer welcome screen” click “Next”. Choose your location and click “Next”. Check the box to accept the terms and conditions and click “Next”. (You have read them first though haven’t you. I mean, we all read the terms and conditions. They are incredibly important after all). Enter the product key that came with your version of “The Sims”. If you bought a CD it should be on the back of the booklet inside the CD case. You can now decide whether to go for a typical installation or a custom installation. I chose the “Typical Installation”. Click “Install” to begin the installation. After the installation has finished you will be asked whether you want to participate in their customer experience improvement scheme. I never say yes to these things but if you want to check the box. EA, please just let me play the game!. Yet more questions. Do you want to install the latest download manager? Again I chose no as I’m not sure how well this would work using PlayOnLinux. Click “Next”. 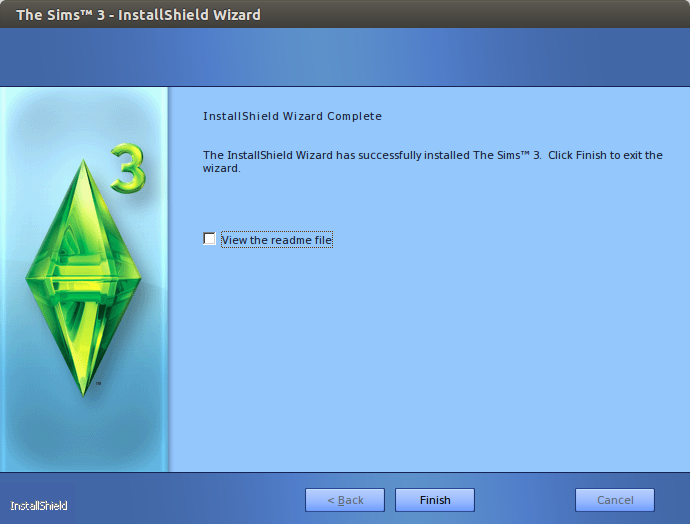 The Sims has now been installed but there are still a few more steps before you can play it. 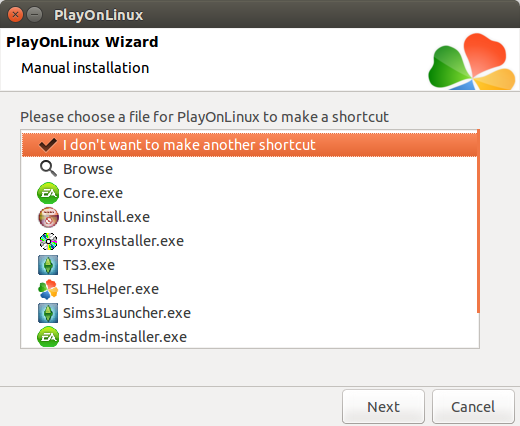 Create a shortcut for The Sims within PlayOnLinux and on your desktop by selecting TS3.exe. You can now try The Sims from your desktop or from within PlayOnLinux by clicking on the icon but I found that it messed with my screen resolution. To fix this from within PlayOnLinux, select Configuration from the toolbar. 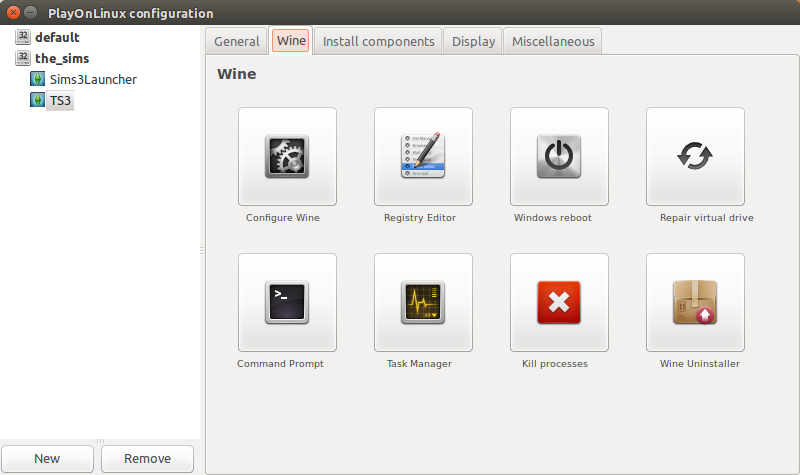 When the configuration screen opens click the “WINE” tab. 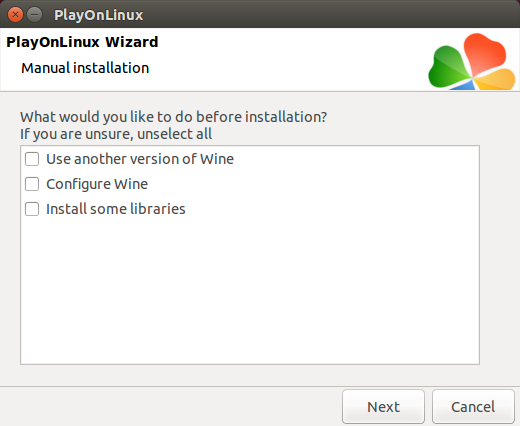 Click on the “Configure WINE” option and when the “WINE Configuration” window loads click on the “Graphics” tab. 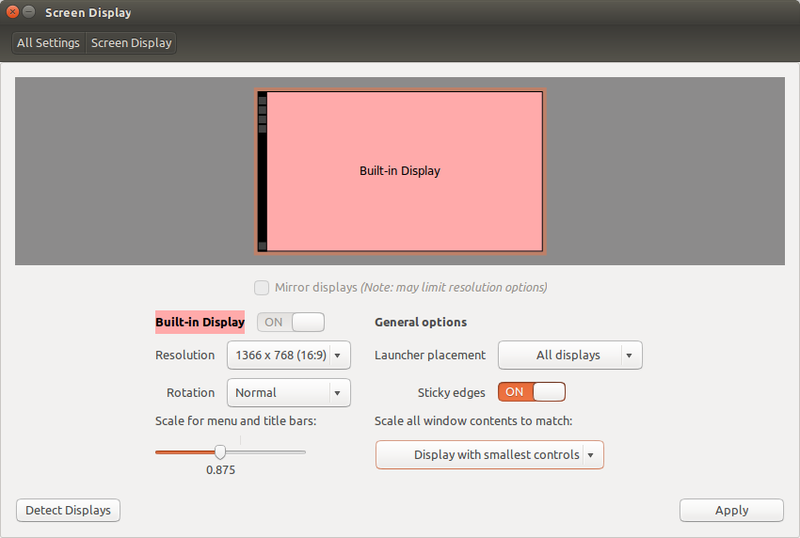 Check the “Emulate a virtual desktop” checkbox and then enter the screen resolution for your monitor. You can find your screen resolution information by clicking the settings icon on the launcher (cog and spanner). From within the configuration settings select “Screen Display”. Your screen resolution will be displayed. After setting the screen resolution, click “Ok” to finish configuring WINE. I have played the game a few times in the past few days and I have been able to load and save games flawlessly and play without any errors. I hope this guide helped and thankyou for reading. First of all, thank for your tutorial. It is simply well explained, step by step. … but I have a problem and I wonder you can help me. I am installing the game with original CD. All installation goes well until the final page (where it ask if you want to play the game now); it does not appears. Wine and PlayOnLinux keeps loading for long time without final action. I have waited but nothing happens. I restarted PC but TS3's icon does not appear. So, I reinstall the game again and finally I have same results; waiting for the last installation page. Could you help with this kind of error? Hi Shiva, I had the same problem and it was related to dirty CD-ROM. I've cleaned the CD and everything goes all right. Has anyone done this succsesfully from an ISO rather than the CD? I have a Sims 3 CD but the system I am instlaling to does not have a drive to read it. I used another system to create an ISO and transferred it via USB. When I follow these instructions, after launching the installer it asks me to insert the CD in drive Z:. Even when I configure Wine to map Z: to the folder I have mounted the ISO to it still prompts me to insert a CD. I am tinkering with different configurations but nothing seems to make a difference. If you want to go down this route then I would suggest dual boot Windows and Ubuntu. 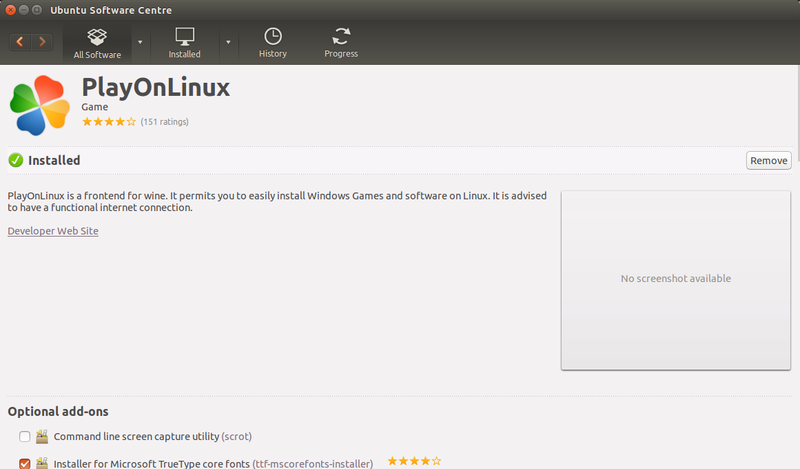 Game on Windows and do everything on Ubuntu, ease yourself into it. Yes there are plenty of work around for gaming on Linux but at the end of the day most titles will simply run better on Windows due to DirectX support. What about adding expansion packs? How can I play "Immortal Cities-Children of the Nile". I have the 2 CDs. Can you add "Children of the Nile" to the list? A big thank you for this post ! It has really helped me ! Nice work guy ! I installed the base game and some expansions of sims 3 and it seems to run smoothly until I load a town – it crashes then. Any ideas? everything works but I can't seem to pull up the launcher, I wanted to add some custom content but it just gives me a blank blue screen. Any ideas?